to define "Journey Soulfully" with a custom tea blend! All teas can be purchased her on the site at the VGB Commissary! We met last summer you talked about your journey from being a lawyer at one of the nation’s top firms to being barista at David’s Tea to learn the ropes to tea blending before starting Heirloom Philly… Can you retell this story for the readers? Sure. I worked at a big law firm for several years in New York City. I knew almost immediately that both the work and lifestyle that accompanied the work was not a good fit for me. I quit my job, moved from my apartment in Manhattan to Brooklyn and kinda just took time to find myself and do exactly what I wanted to do each day. I always had a little dream to own like a cafe combined with a bookstore. I decided that one of the best ways to learn how to run a tea room, which is my goal, was to work at one. I took the first related job that I got which was working at a brand new David’s Tea in King of Prussia Mall. It was very humbling going from making six-figures to minimum wage. But I chose to be there to learn. So I took notes on everything I learned working there for maybe about nine months. I used all the information that I learned on daily basis about tea to begin blending my own teas. I could have just took a really expensive class on running a tea business but this way was much more practical. It was very humbling going from making six-figures to minimum wage. But I chose to be there to learn. What is the general narrative that your teas tell? My teas have several themes. One is simply health. Many of our teas were created to address certain health concerns. So for instance we have herbal tea blends such as Healthy Joints, Healthy Heart, Metabolism Booster, Energy Booster, Moon Time, and others that contain herbs reported to help the named issue. We also make custom tea blends meaning our clients will want to use certain ingredients to create a new tea and I will work with them to come up with something for them just like we did for Soulful Journey. Aphrodisiac, a chocolate tea, and Berry Zen, a tea containing hemp seeds and berries, are examples of custom teas. Would you say being a tea blender is like being a healer? How so? I think it depends on the individual because some people are creating teas for the sole purpose of making money. Others may indeed see themselves as healers, herbalists, medicine women/men, or even shamans who use plants to access beyond the veil into the spiritual realm. I practice other healing arts such as energy healing, or Reiki, meditation, and also use spiritual tools such as incense, oils, candles, and crystals. So I definitely see myself as a sort of modern day medicine woman seeking to bring balance to the earth. To “journey soulfully” is to follow one’s inner self guidance system or intuition. It means listening to the whispers and tuggings of one’s heart. And learning to be still so that you can draw from that deep wisdom that is with you always. What has life taught you about Journeying Soulfully and how does tea/blending fit into this? Life has taught me to listen to and trust in my inner guidance system. I think that all young girls should be taught to listen to her higher self. Also to do my best to turn to the positive things in life and not dwell on negativity in all the different ways it comes forth - be negative inner self talk or watching the evening news - to give up quickly those thing that do not serve my path. Tea blending fits in because it allows me to exercise aspects in myself that are important to me such as creativity, simplicity, and freedom. 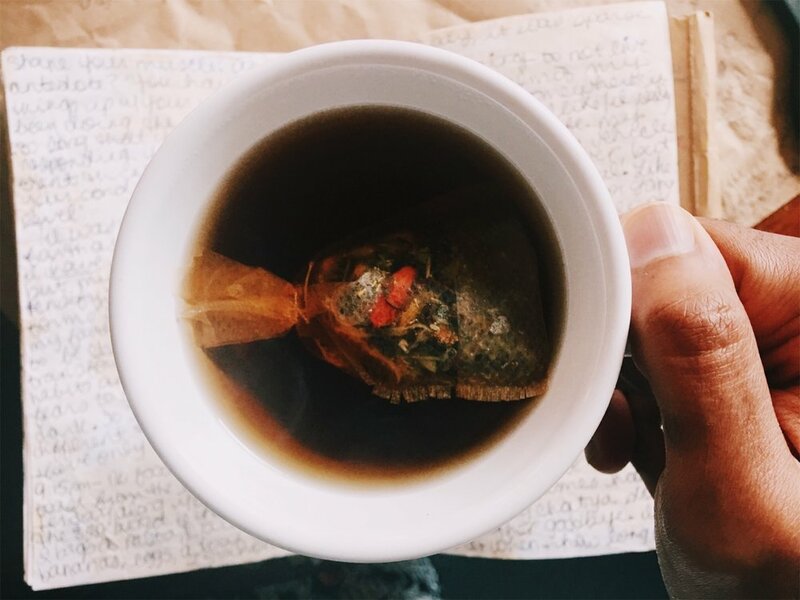 Tea is one of a variety of elements we can use to create a quiet space/atmosphere to center in silence, pull out our journals and write. What other elements are favourite to create space? Yes, I agree that tea can absolutely so that for us. Other elements that I find helpful for creating a quiet environment to center are some that I mentioned above such as burning oils, candles or incense, but also cultivating plants and flowers within your space and most importantly to me practicing minimalism. Decluttering is at the top of my list for creating a space or calm, peace and balance. Ok, this is exciting. First time I’ve ever commissioned a custom tea blend for Vagabroad--EVER--and I am excited to learn about your interpretation of “Journey Soulfully” into a tangible, drinkable definition! What was you inspiration when you started the herbal selection and blending process? My primary inspiration was my own personal journey. I picked herbs and teas that reflected parts of my journey in particular, but also reflected that of those on a spiritual path in general. So: What are the tea’s ingredients? Tell me the the story behind their selection. Why’d you choose them, etc. When we met, you told me about your love of sage so I worked around those flavor components first. I loved including sage because for me it symbolizes wisdom and growth that develops over one’s life time. I decided to add two black teas into the mix - an assam for its deep flavor and an interesting smokey tea called lapsang souchong. I chose this particular tea to represent divine timing and patience. I have found both to be instrumental in my own journey. I then wanted to add ingredients representing personal power which we pull from our solar plexus chakra. I decided on calendula and chamomile flowers since they represent the sun. Lastly, I wanted to include a plant to symbolize love energy and the nurturing power of the feminine principle so here I chose the goji berry which to me reminds we of the womb-man in so many ways. But I will leave that to your imagination! ...Music genre? Reggae and 80s r&b. ...Song(s) of the moment? Bruno Mars - That’s What I Like. ...Tea? Heirloom’s Aphrodisiac chocolate tea. ...Space to meditate? At the beach. ...Place to travel? Aruba or Spain. ...quality about your blend of Journey Soulfully tea? The smokey richness. my husband Omar, my baby Malik, art, museums, books, music and travel. Do you keep a journal? If so, why? I’ve kept journals throughout my entire life. I sometimes think I will use them to write a book. I am not sure why I started keeping a journal. I rarely go back to read them. At the moment I am keeping a gratitude journal. Every day I write down ten things that I am thankful for. I believe in the law of attraction so I do my best to focus on things that make me happy. Why do you believe tea drinking is important, especially for teastained women? I think taking the time to prepare tea is an important meditative practice for those seeking to make it one. But also the taking or drinking of tea itself, either alone or with others, can also be a calming, renewing, and balancing action. Plants are medicinal. So the ingesting of the tea can also bring about certain physical manifestations like the soothing properties of chamomile flowers. Plants, according to people like George Washington Carver, can teach us many things. Other believe that plants have spiritual healing properties. When teastained women make tea time a ritual act, it becomes an empowering one where you take time to go within and connect to a power higher than the physical self. This is important because of the nature of the society we currently reside in, to be able to access that inner wisdom. OK. Life as teastained women in 2017 has taken on a heavier mantle in terms of creating the future and defining ourselves as ancestors for the next generation. What are some habits we as teastained women can assume as sojourners to Journey Soulfully and carry ourselves ancestrally? As I’ve said, it’s important to listen carefully to our intuition. Also, we must learn from our ancestors by reading their stories and teaching them to others. Also, we must learn to listen to nature. Nature has many lessons to teach us. I think it’s also important to build a spiritual practice that resonates with you - one that will provide you with strength and a way to pay homage to your ancestors. Lastly, I think we should be aware of our vision and purpose. And with those things in mind, what daily practices we can incorporate into our lives to ensure that we are working towards living out those aspirations. Why will future generations need to know that you existed? They don’t need to know at all that I existed.